Cats are notoriously independent, and approaching a cat for the first time is not always easy. By nature, cats are territorial, and they rely on their sense of smell to evaluate situations which include meeting a new person. You need to be patient when introducing yourself to a new cat, and allow the cat to approach you. Once the cat feels comfortable, you may be able to pet them. It may take time, but will be worth the effort. Each cat is unique, and has a different comfort level around people. Some cats are friendly and eager to become friends, while other cats will always want to keep some distance from strangers. But all cats feel more comfortable when they are in control when meeting someone for the first time, and will need to investigate with their strong sense of smell. 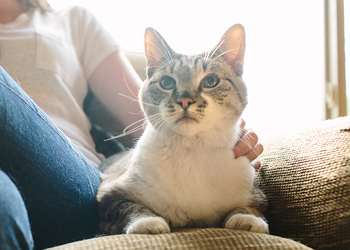 Always ask the owner about their cat’s temperament, and whether the cat is typically friendly with people. Cats generally do not like loud noises, or sudden moves; and make sure the cat does not feel trapped. Also, if a cat runs away, never chase after the cat. Once the cat calms down, you may have another chance to get to know each other. The best way to meet a cat is to get down to the cat’s level, and simply extend your index finger for the cat to smell. Don’t wave your finger, or put it too close to the cat. Just by letting the cat investigate, the cat will feel much more comfortable. Once the cat has a chance to smell your finger, the cat may rub your finger with a cheek, or press against your finger with a shoulder. That is a sign that the cat feels comfortable with you, and may welcome an attempt to pet them. If you’ve really hit things off with your new feline friend, you can try these six steps for teaching a cat to high five. However, this should only be attempted after you’ve developed rapport with the cat and as always, with the owner’s permission.